If you don’t use a VPN that often, or at least not often enough to justify paying a monthly or annual fee, you may be interested in the services provided by VPNBook. VPNBook is a free VPN service which does not require a separate installer. The service is provided by a Romanian company called Voxility. It is easy to set up, and also not as intrusive as some other VPN services you may have used, although you may wonder why such a good service is available for free at all. Indeed, some groups have actually alleged that VPNBook is a scam service which collects and forwards user data to governments. It seems most likely though that VPNBook is a profitable company which is doing just fine by drawing lots of traffic to its advertisements. The ads, while relatively unobtrusive themselves, probably provide plenty of income to the company. If you are brand new to VPN, this might be a good place to start. VPNBook conceals your geographic location and protects your privacy by encrypting all your data. While the company does not charge for services, they do accept donations via standard currencies or Bitcoin. You are jumping on a wi-fi hotspot at a coffee shop, airport, or another public location, and you want to make sure that your transactions are secure. Perhaps you are on a friend’s network, and you do not trust the encryption. Any time you are on an unsecured network, it is a good idea to make sure that your data is safe. VPNBook is perfect for this kind of application. You want to hide your IP address in order to access services which are blocked on your network (Gmail for example). You are trying to view streaming content which is disabled for viewers from your country. VPNBook can disguise your IP address and allow you to view the content. Microsoft Windows: Windows 7/8, Vista, XP, 2000, NT. Note that PPTP VPN only works on Windows 7. Mac OS: Mac OS X, OpenVPN only. iOS: iPad, OpenVPN and PPTP VPN. Android: OpenVPN and PPTP VPN. VPNBook is very flexible and works on all Windows PCs and laptops as well as Mac laptops and desktop computer. iPads are supported as well as Android devices. Note that if you run the Ubuntu operating system on your computer, you can also use this VPN service. VPNBook does not list support for other types of devices such as Chromecast or Apple TV, and presumably cannot interface with these devices. If you want to watch streaming media, you will need to do it from a PC, laptop, or mobile device. VPNBook offers two different types of free VPN accounts. Most users will be interested in Free OpenVPN. This open-source VPN software is compatible with more systems than the free PPTP VPN service, and is also more secure. In orders to use the account, you will need to download the OpenVPN Client, which is also free and open-source, along with the configuration and certificate bundle. The other type of account this company offers is the Free PPTP VPN. PPTP stands for “point to point tunneling,” and is designed to offer broad compatibility. It also gets you around having to download and install the OpenVPN Client. It has some drawbacks, however, since it is less secure and easier to block. OpenVPN is easy to install and get set up, and once you do, you will probably find that it offers you superior service. 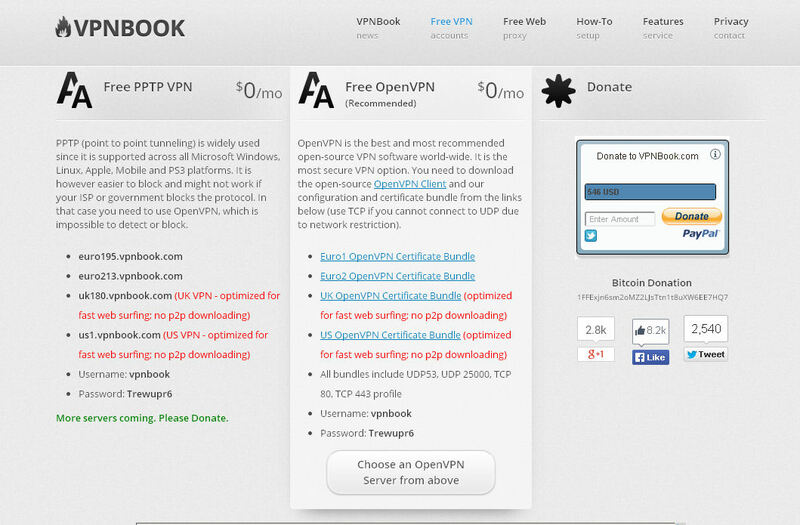 For many users, the OpenVPN Client will be necessary in order to use VPNBook’s services at all. Additionally, VPNBook offers free web proxy service. Using this service is easy. You simply navigate to the Free Web proxy page, and enter in the URL you want to visit. Doing this allows you to hide your IP address and get around IP blocks and geographical limitations. You can also unblock websites such as Gmail or Yahoo Mail which might otherwise be unavailable to you. The proxy service comes with 256-bit SSL encryption. No installation is necessary. You can consider this a kind of “lite” version of the VPN service which is simple to use and great if you just want to drop by a single website without going through all the trouble of getting your VPN running. If you plan to do a lot of browsing though, it makes a lot more sense to use one of the free VPN accounts instead. Being as VPNBook’s services are free, there are no account tiers guaranteeing different levels of privacy. VPNBook guarantees that all transactions are encrypted on all accounts using AES-256 and AES-128. According to the company, it would take thousands of years for the fastest supercomputer on the planet to crack that kind of encryption. Further, VPNBook also promises never to store internet browsing traffic. No private data is ever collected. All the company retains in its logs is the IP address and the connection time for each use of the VPN service. Once a week, these connection logs are purged (if you are in a hostile situation, this may not be fast enough, but should be fine for standard, casual use). Two of the VPN servers are located in countries which do not require that VPNs share their data with governments. This ensures that you are protected from government snooping. For faster browsing, you can use a UK or US server instead. The company does not provide any information regarding the pool of its IP addresses and how many IP addresses are available. As this is a no-frills VPN package, you cannot select your own public IP address. The system will assign one to you. VPNBook does not restrict bandwidth in any way for its users. You can use as little as 1GB or as much as 100GB in a day and experience the same access speed. That means you can use VPNBook for torrent downloads and for streaming services without restriction in quality or speed. There are no restrictions on websites or content either. As you might guess, the user interface, like the service itself, has no bells and whistles, but it is simple and straightforward and easy to adapt to using. There are not a lot of settings, but this is to be expected. Remember, you can choose your server at the outset. The Romanian servers provide you with the best privacy, because they are not in countries with severe privacy limitations. The US and UK servers are faster though and ideal if you want to play games, download media, or stream videos. With four servers running, you are unlikely to experience downtime. Disruptions are usually the result of the password changing, which is a regular event. Check the site to see which servers are running and find out what the new password is if you get dropped. Our tests showed no major stability issues or downtime. Some users find it annoying to have to check for a new password regularly, but this is part of what makes VPNBook’s service secure. We measured the average upload speed for VPNBook to be 0.37 Mbps and the average download speed to be 1.83 Mbps. This is on par with the majority of other free VPN services in existence; it is faster than some such as TorVPN and slower than others such as OkayFreedom and Spotflux Free. If you need more speed, you probably want to look into a VPN service with a monthly fee. As it is, you should be able to stream videos without much lag and even play video games without a lot of hassles using VPNBook. This is particularly true if you are using a US or UK server. The Romanian servers are slower. With top-notch encryption codes and servers located strategically in countries which are not regulated by laws such as the USA Patriot Act, your data is actually secure with VPNBook. This provides an advantage over many companies which only have servers in countries where information is highly regulated and privacy is virtually nonexistent. VPNBook invites contact via their web form or email support address. They also have pages on Facebook and Twitter, but no phone number is available, which is something of a drawback. There is also no live chat. If you do not regularly use a VPN service, and want something convenient for occasional use, or you simply do not have the money to shell out for a monthly service package, VPNBook may be a great working solution. You could also consider using it as a backup solution. It is about as unintrusive as any service you are ever going to find. They offer top notch security and no bandwidth limitations, and with OpenVPN and PPTP, they offer more than one way to connect. This makes them flexible, secure, and easy to use.